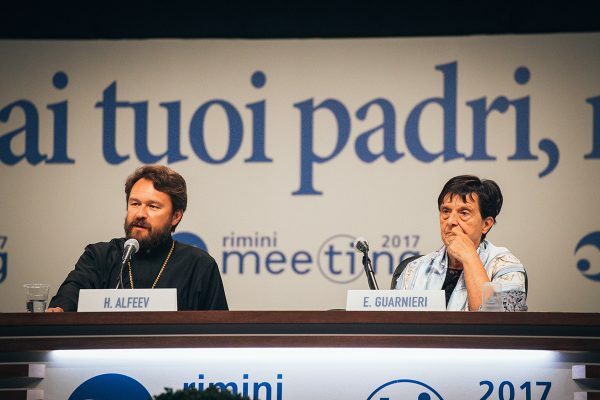 On 24 August 2017, Metropolitan Hilarion of Volokolamsk, chairman of the Moscow Patriarchate’s Department for External Church Relations, attended the 38th Meeting for Friendship Amongst Peoples organized by the “Communion and Liberation” Catholic association of laypeople in Rimini, Italy, on 20-26 August 2017. As part of the forum, held annually since 1980, various exhibitions, round table discussions, concerts and other cultural events are held, dedicated to the most important events, from the Christian perspective, of today’s life. Up to 800 hundred people attend the meeting every year. Among those who took part in the previous forums were Pope John Paul II, Mother Teresa of Calcutta, the 14th Dalai Lama, and other religious leaders, thinkers, politicians and cultural figures. The following words from Goethe’s “Faust” – “What you inherit from your father must first be earned before it’s yours” – were chosen as this year’s meeting. The heritage and the experience accumulated by the previous generations were the central topic of the forum. The DECR chairman was accompanied on his visit by Rev. Alexy Dikarev.